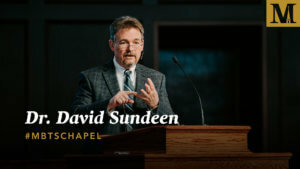 On anything but a spring day in Kanas City, Midwestern Seminary opened its semester with President Jason Allen’s Academic Convocation message in the Daniel Lee Chapel on Jan. 22. 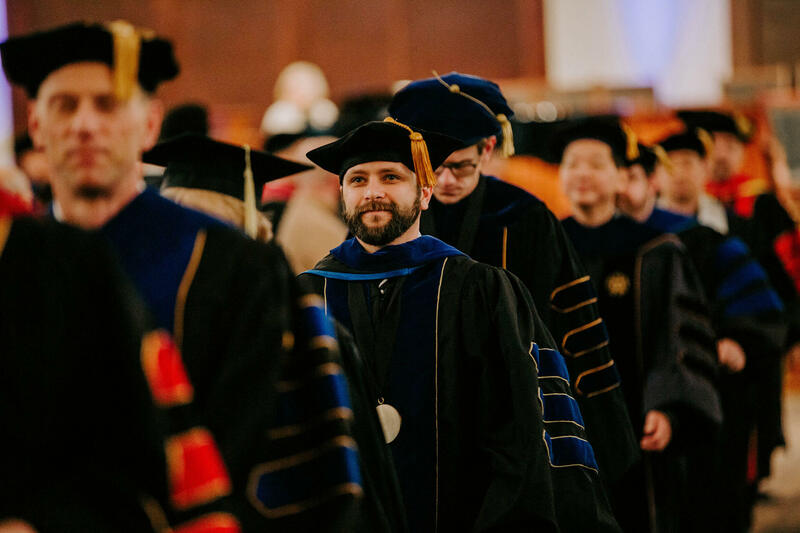 Additionally, two of the seminary’s faculty signed the institution’s Articles of Faith and three newly appointed faculty members were welcomed. Allen greeted new students, faculty, and guests with an exposition of 2 Timothy 2:15, stating that the passage was applicable to everyone in attendance. To the first section, Allen challenged all in attendance to avoid the pitfall of starting strongly and then slowly digressing in one’s ministry. He encouraged the audience to persist in this effort. In proclaiming the Word of God, Allen said to not “just open the Book like you would any other book;” rather find oneself approved by God in his proper handling of the Word throughout one’s ministry. In explaining the third part of the passage, Allen said as a pastor progresses in his ministry, he should also be growing in his handling of God’s Word. In addition to Allen’s message, two faculty members signed the institution’s Articles of Faith, which consist of the Baptist Faith & Message 2000, the Chicago Statement on Biblical Inerrancy, and the Danvers Statement on Biblical Manhood and Womanhood. Matthew Barrett, who serves as associate professor of Christian Theology, and Dale Johnson, who is associate professor of biblical counseling, were both elected by the Board of Trustees in October 2018. As such, by signing the book, they promised to uphold Midwestern Seminary’s Articles of Faith. In other academic news, Allen announced three appointments to Midwestern Seminary’s faculty. Shin Il Liu was appointed as associate professor of ministry & director of the Chinese Studies Program. Liu holds Ph.D. degrees in International Politics (from the China Academy of Social Sciences) and International Economics (from the University of Nebraska, Lincoln). He also earned a Master of Arts in Economics from the University of Nebraska, Lincoln. He holds a Bachelor of Arts in Business Administration from National Taiwan University in Taipei. Liu dedicates time to education projects and ministries related to China and Christianity. He has been involved in missions projects with the International Mission Board and South Korean Baptist Churches throughout East Asia since 1993. He is married to Myungsuk Yun, and they have two children. Margaret E. Köstenberger was appointed as associate professor of theology and women’s ministry as well as faculty coordinator of Women’s Ministry Programs. Köstenberger graduated from McMaster University with a BSc in Nursing and completed a Master of Arts in Intercultural Studies from Columbia International University where she met her husband, Andreas J. Köstenberger. In 2006, she completed a Doctor of Theology through the University of South Africa with her dissertation being on the topic of feminist hermeneutics, which has been published in revised format by Crossway as Jesus and the Feminists: Who Do They Say That He Is? Köstenberger has taught previously at Southeastern Baptist Theological Seminary and Shepherds Theological Seminary, where she served as associate professor of theology and as director of Women’s Programs and Mentoring. Her main passion is mentoring women to embrace their unique God-given role and to equip them to serve their families as well as other women. The Köstenbergers have four children. Felix Cabrera was appointed assistant professor of pastoral ministry & coordinator of Hispanic Graduate Studies. 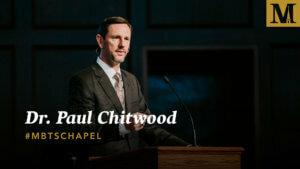 He holds a Bachelor of Business Administration with a concentration in management from the University of Puerto Rico; a Master of Arts in pastoral counseling from Liberty Baptist Theological Seminary; and a second Master of Arts with a concentration in church planting from Southeastern Baptist Theological Seminary. He is currently completing his Doctorate in Ministry degree with a concentration in leadership at Midwestern Seminary. Cabrera currently serves as second vice president of the Southern Baptist Convention, is the executive director of the Convention of Southern Baptist Churches in Puerto Rico, and the director of Send Network Puerto Rico. He is married to Denisse, and they have two daughters.